Pass by the Art Deco hotels along Ocean Drive and take refuge in the classic, tasteful interiors of this refined South Beach retreat. 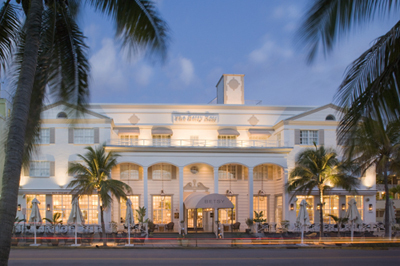 As chic and classic as this South Beach standout is, The Betsy remains, in fact, a renegade among the curved and pastel Art Deco hotels that predominate along Ocean Drive. Originally named The Betsy Ross Hotel (yes, for America's first flag seamstress), she was built in the 1940s in homage to a colonial-style nostalgia that was sweeping the nation--hence her graceful arched and four-columned portico and signature shuttered windows. In 2009, The Betsy South Beach reopened after a complete renovation that preserved her classic façade and at the same time updated her interiors to create a welcoming, luxurious tropical retreat with the feel of a well-heeled global traveler's personal residence. Cool, whitewashed public areas, huge potted palms, and beach-awning-striped furnishings greet visitors who escape into this tranquil boutique hotel from the sun, sand, and general hubbub of South Beach. Not to be overlooked are The Betsy's 61 rooms and suites, comfortable beachside havens with British colonial touches like white wooden plantation shutters and dark walnut hardwood floors. Thassos-marble-lined bathrooms have walk-in showers, plush bathrobes, and luxurious apothecary bath amenities--just the sort of indulgences that make it hard to tear yourself away. But then, you'd miss the serene courtyard pool and the rooftop deck with its Wellness Garden & Spa, an al fresco, Zen-inspired oasis where signature therapies like the Mojito Mint hand and foot treatment are delivered in private, shaded cabanas. Yet another dimension to this surprising hotel is its literary/fine-arts bent. In-room libraries are filled with signed books by major writers, bits of poetry are left on the pillow at turn-down each evening, and book signings, poetry readings, live jazz, and art exhibits--hosted in public spaces--are designed to motivate you to pause during your busy day. Finally, carry that relaxed feeling with you to dinner as you savor high-quality beef and fresh seafood at BLT Steak, all the while enjoying prime viewing from the restaurant's al fresco terrace, perfectly situated on Ocean Drive.